Jess has been with us for almost a year and has been working hard to improve her weaknesess over this period with great success. 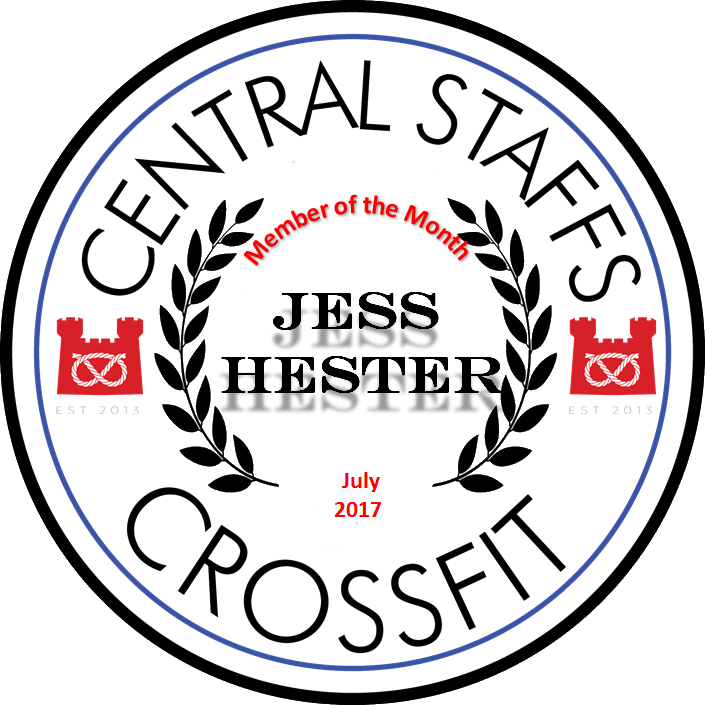 Jess is a valued member of our community and is always around before and after the WOD's to cheer people on. Her laugh and smile are infectious especially when she hits a new PB. Congratulations on your continued hard work we will all be sad to see you go. August 31st 2017 sees CSC say Au Revoir to the man, the legend that is Kanukai “Kaj” Jackson. As a member of CSC I can honestly say that Kaj’s presence was felt, and I mean this literally. Remember the days when you thought you had your stretching technique nailed then Kaj came along and asked you to move your thumb a little more, or raise your arm a little higher and then you felt a whole world of pain and realised that you was actually coasting!! It is hard to put into words how much Kaj is respected as a coach and what he bought to the table for the rest of the CSC coaching team and although he is moving on he will always remain a huge part of the Central Staffs CrossFit Community. Unfortunately due to low numbers we have decided to remove the Endurance class from the weekly timetable. Despite the class delivering excellent content and those who attending seeing real results we feel it is best to use this time to accommodate more members. Rest assured the hard work that Paul put in to deliver these sessions will be available in another medium soon (watch this space). With endurance removed from the timetable, we are bringing in a new open gym slot in its place. this will allow you to come and do an Open Gym session on a Tuesday evening from 7:30pm - 9pm. As always use the time to work on weaknesses, develop new skills or build your own workouts. In addition to the new Open Gym sessions we are adding another weightlifting class on Friday evenings between 8pm - 9pm. This class will be in addition to the one run on a Wednesday evening. For those of you new to CSC this is a great class to concentrate on your weightlifting movements with a highly experienced coach. The class offers you the chance to have your own personal movements refined and for your weightlifting efficiency to be greatly improved. Rifleman Vijay Rai from 2nd Battalion The Royal Gurkha Rifles was killed in Afghanistan on Saturday 15 October 2011. Rifleman Vijay Rai took over a sentry position on the roof of TCP Rome, and about an hour later the checkpoint was attacked with small arms fire. Rifleman Vijay Rai was hit in the opening burst.